Flip2BFit® – Preventing childhood obesity one exercise at a time! This simple statement has become our mantra and our destiny. Opening up the minds of children and their parents to the fact that a healthy lifestyle is possible and that it is within their grasp is the first step to providing a platform to get out in front of childhood obesity. Through the introduction of Yoga, Cardio, Stretching and Strength Flip2BFit gets everyone UP, MOVING, LAUGHING and having FUN together as they take step one to living a healthy lifestyle. A truly amazing game, Flip2BFit is Fitness Made Fun through fitness activities for kids! This effort to prevent childhood obesity while playing a fitness fun game for kids has become a team effort with our various partners both locally and across the country. Starting with a local organization: CHALK (Choosing a Healthy and Active Lifestyle for Kids – a Not for Profit Organization run by Columbia University Medical Center and the NY Presbyterian community) to Fit to be Kids, Inc. in Southern California that brings fitness fun to low income neighborhoods, Flip2BFit is providing a platform for kids to overcome exercise fears, get up and start moving and all while having fun and getting fit! Fit to be kids implements the board game in to their Saturday morning fitness activities and shares with kids physical activities that help keep them active fit and healthy!Flip2BFit also takes great pride in giving back to help open the minds of children on the other side of the world to what a healthy lifestyle is about. We partner with Fitness for Africa, a Not for Profit Organization that brings organized Fitness Instruction to schools throughout Uganda and educates students and their parents about what a Healthy Lifestyle means. Through these incredible projects we are dedicated to assuring that all aspects of a Healthy Lifestyle: Fitness, Nutrition, Health and Lifestyle are made available to the men, women and children throughout the US and Africa that we touch. Through Flip2BFit® board game sales and events, funds are raised to ensure we do our part to take step one to providing better tomorrows! The exciting new kids fitness board game. Innovatively incorporating yoga, cardio, stretching and strength to get everyone up, moving, jumping, laughing and just simply having FUN while exercising. Play as individuals or groups no equipment or experience needed. Spin a wheel, pick a card, complete an exercise individually or as teams and strategically make your way to the finish line. A board game like no other creating healthy lifestyles today that will last a lifetime ahead. Whether played for family fun game night or with friends on a rainy afternoon, Flip2BFitÂ® is this generation's answer to Kids Fitness made Fun. Flip2BFitÂ® is Fitness in a Box, the exciting new board game you can play anywhere. Don't be left out of the fun. Bring your game home today and enjoy family fun time with a new twist. PE Teachers - Teachers and Parents alike - Flip2BFit is correlated to All US National and State PE and Health Curriculums! Good for 2 - 4 Players or Teams - Age 6+ recommended. Fitness in a Box! No equipment or experience required - Just open the box and take step one to Fitness Fun! Great for Teachers to use as a transitional tool to get kids up moving and keep them interested in the daily educational activities. Great for Family Game NIGHT! Get your family together or have several families over and play family against family! Learn basics of Yoga, Cardio, Stretching and Strength as well as basic Nutrition facts to get you started on living a healthy lifestyle. My kids and I absolutely had a blast playing Flip2BFit's Fitness Board Game! My kids see me living an active life style and love to participate anytime they can. I love the whole concept of this game. Getting kids to be active isn't as easy as it was back in the day when I was a kid. In today's world when kids play games together it's usually online while they both sit at their own homes on the couch. There's little to no physical activity and children are becoming obese. This is a great way to help kids be active. 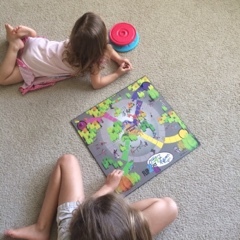 Flip2BFit's Fitness Board Game was so cute to watch my kids play. The stretching, yoga, cardio and strength cards have them do so many seconds or reps to move spaces on the board game. This will be great to have around for the summer now that it's too hot to play outside. Instead of turning on the television I'll be bringing out this board game to keep my kids fit and healthy. Check out my review of Flip2BFit's Bakari Fitness Memory Game for even more ways to get fit while having a blast! Follow Flip2BFit on social media!